Ten years after Chris Moneymaker parlayed a $39 investment in an online poker tournament into a $2.5 million payday as the 2003 World Series of Poker champion, the “Moneymaker Effect” continues to impact the poker world. 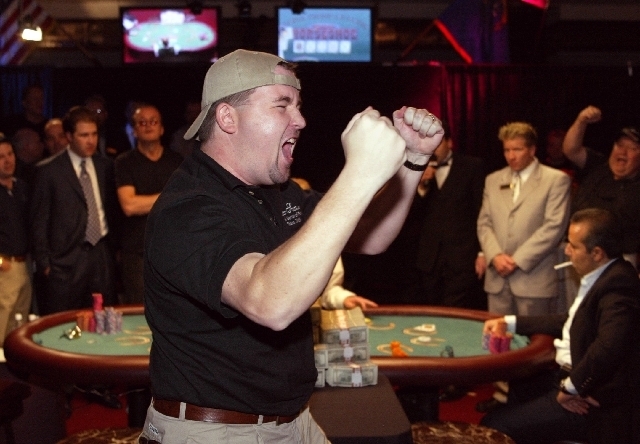 Chris Moneymaker of Spring Hill, Tenn., celebrates his World Series of Poker victory over Sam Farha, seated right, at Binion's Horseshoe on May 24, 2003. Moneymaker, who never had played in a live, no-limit poker tournament, earned entry into the WSOP by playing in an Internet tournament. The Tennessee accountant’s historic upset victory ignited a poker boom in the United States and abroad, with the total number of entries and prize pool for the WSOP each growing tenfold over the past decade. While 7,572 official entrants vied for less than $22 million in prize money in the 2003 WSOP, last year’s event featured 74,766 entries and a record prize pool of more than $222 million. Moneymaker, 37, will be honored at the 44th annual WSOP, which will take place Wednesday through July 15 at the Rio and is expected to attract a record number of entries. “We all owe him a great debt, as he’s been an outstanding ambassador for poker and really embodies the growth that we’ve seen the past 10 years,” WSOP executive director Ty Stewart said. In a story that couldn’t have been scripted better by Hollywood, an amateur poker player named Moneymaker won a seat at the $10,000 No-Limit Hold ’em World Championship — aka the Main Event — almost by accident, through a tourney he didn’t realize was a satellite until after he entered it for $39. In fact, had Moneymaker known it was a satellite — a tournament in which players qualify for another tournament with a larger buy-in — he said he never would have played in it. Backed by a friend named Gamble, Moneymaker ventured to Las Vegas to play in his first live poker tournament, which he won by busting seasoned poker pro Sam Farha — whom Moneymaker bluffed all-in with a king-high against a pair of nines before winning the WSOP by catching a full house on the river. Viewers were able to follow every step of the action closer than ever that year, thanks to ESPN’s use of hole-card cameras for the first time. While Moneymaker outlasted 838 players to win the 2003 crown, the number of entrants to the Main Event tripled in 2004 and increased to 6,598 last year, when the prize pool for the title eclipsed $62 million. “Some people will curse (Moneymaker) and say he made it much harder to win the Main Event,” said Seth Palansky, vice president of corporate communications for Caesars Interactive Entertainment, which owns the WSOP. Moneymaker — whose name derives from German ancestors who used to make silver and gold coins — has won nearly $1 million since his momentous win but hasn’t cashed at the WSOP. Moneymaker has only himself to blame for fueling the game’s growth. A married father of three, Moneymaker quit his job as an accountant after winning the title to serve as a spokesman for PokerStars.com, the website on which he earned entry into the WSOP. The prize pool for the past six years, which has totaled $1.11 billion, has doubled the total prize pool of the first 37 years of the WSOP. Greg Merson of Laurel, Md., won the 2012 WSOP Main Event, making more than $8.5 million. Moneymaker will be honored during one of three starting flights for this year’s Main Event, which will be contested over 10 days beginning July 6. The final table of nine will be determined July 15, when play will be halted until November. A record 480 poker tables will be set up inside the Rio Convention Center to accommodate this year’s tournament, which will feature 62 gold bracelet events over 48 days. The $500 buy-in Casino Employees tourney will kick things off at noon Wednesday, and the action will heat up quickly, with the “Millionaire Maker” no-limit, hold ’em tournament scheduled for Saturday. For a $1,500 buy-in, someone will walk away with a guaranteed $1 million first-place prize. Other notable events include the $111,111 buy-in One Drop for High Rollers, which is slated for June 26-28 and is expected to draw about 100 players for a prize pool of $10 million. It will benefit the One Drop water awareness charity. Last summer’s $1 million buy-in Big One for One Drop was sold out and raised $10 million for charity, including $5.3 million for One Drop. The tournament paid out the largest prize in poker history, more than $18.3 million, which was won by Antonio Esfandiari. The $1,111 buy-in Little One for One Drop, scheduled for July 3-4, will offer an unlimited re-entry and is expected to draw about 6,000 players. The $50,000 buy-in Poker Players Championship, slated to start June 30, is an eight-game mixed event akin to an all-star game that determines the game’s best all-around player. Michael Mizrachi of Florida won last year, making $1.45 million. In addition to the official bracelet events, daily deepstack tournaments will take place at 3, 6 and 10 p.m. at the Rio throughout the WSOP, along with the Carnivale of Poker, which will feature 21 tournaments starting at 11 a.m. Mondays and Tuesdays. The winner of each Carnivale event will be awarded a gold and diamond medallion, and the top 10 players will claim a share of $100,000. Last year’s WSOP featured more than 220,000 combined entries from 101 countries in bracelet events, daily deepstack tourneys, cash games and satellite events, and more entries are expected this year. Contact reporter Todd Dewey at tdewey@reviewjournal.com or 702-383-0354.